Today’s post includes a few different cards that I have made using either, or both of the new Fresh Cuts Stamp Set and Fresh Cuts Notes, just to give you some ideas on how these can be used in different ways. First is a card I made this afternoon using colours from a challenge – the colours are Close to Cocoa, Pink Pirouette and Baja Breeze. 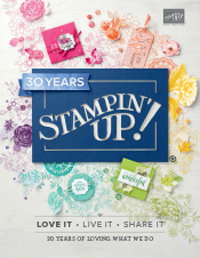 I just love the way Stampin’ Up! introduce new colours which go so well together with their current colours. This is a perfect example, and I just love the way these three colours go together. Cardstock: Close to Cocoa, Pink Pirouette, Baja Breeze, Whisper White. Inks: Pink Pirouette, Baja Breeze. Accessories: Sponge Daubers, Oval Punches x 2, Scallop Circle punch (for the inverted corners), Vintage Brads, Whisper White Tafetta Ribbon. The next two both use the Fresh Cuts Notes, but they are so very different. 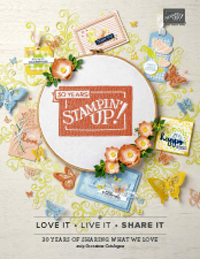 The first uses the Poppin Pastels technique to get the changes in colour across the stamped image. And the second uses white embossing to create a completely different look again. I have also used some of the gorgeous new Flower Brads from the new catalogue. If you are interested in learning some of the techniques used in making these cards, please don’t hesitate to contact me, I run classes in my home on a regular basis. Cardstock: Fresh Cut Notes, Elegant Eggplant, Whisper White. Inks: Elegant Eggplant, Almost Amethyst, Versamark. Yet more gorgeous cards! The pastels look fabulous. Being a fan of purple I think I’d have to vote the Elegant Eggplant one my fave – particularly love the flower brad in the centre. I am sure the girls at your launch were all wowed too. Just beautiful.